On Friday afternoon, I picked up my boys from their half-day camp with a trunk loaded with swimsuits, beach toys and lunch in a cooler. It's one of the benefits of getting up at four in the morning for work this month; I'm done by noon and can take them out for the afternoon. They had their choice of beach or pool, and they chose pool. 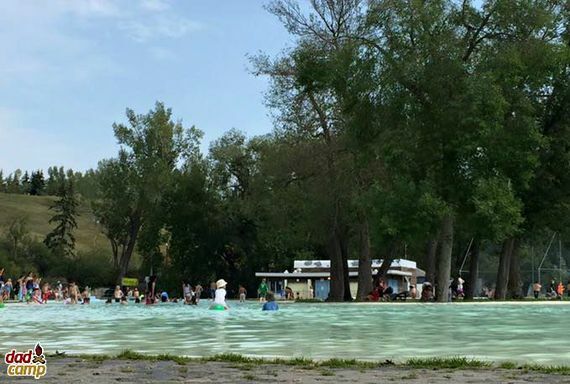 Riley Park pool in Calgary is one of the best in the city. It's a huge wading pool surrounded by grass hills and trees. You can run and splash and relax right in the heart of the city. As the boys chased off into the pool, I set up shop off to the side in the shade. I unloaded the blankets, chairs and cooler, and then laid down to start blowing up their inflatable whale and crocodile to play with in the pool. It's a big pool, so the boys are long gone as I'm huffing and puffing away at these things when a girl, about four years old, starts to stare at me from a few metres away. Then she takes a step closer, and a few more. "Hi!" I smile, trying to look past her at my boys while I continue to blow up the whale. Soon, she's joined by a friend and the two just stand and stare at me, as kids do. "Can I have one?" one girl asks. I mention they're for my sons, all the while scouring the lawn for the glaring eyes of moms. "I'm here with my boys, I'm not luring girls!" my mind yells. "These are for my sons," I tell her and the girls run off to the side where I finally catch the eye of their mother offering as nice of a smile as I can and a shrug as if to say "kids will be kids." The girls come back and lurk again. I tell them to ask their mom if they can use the toy, hoping my boys won't notice I've loaned them out to others while they're off at the other end of the pool. "We're not supposed to talk to strangers," one of them snarks. Yup, totally get that, kid. So, why did you wander in front of me, stare at me, engage in conversation with me and make me feel like a total predator just for being at a pool where it appeared I was alone by the entrance luring young girls with inflatable toys!??! Eventually, my sons came back, pounced on the toys and went off galloping into the pool, rescuing me from the begging eyes of the girls. There are signs up at parks in some cities notifying men they are not welcome without children. On this random Friday afternoon in the midst of summer, with hundreds of kids in the pool and dozens of parents on the grass watching them, I was one of perhaps eight males in attendance. In a charge to make parenting equal, I first need to get over the guilt I feel about being an engaged dad. Taking my kids out, on a weekday afternoon, means entering the realm of the SAHM -- Stay At Home Mom. Flip through the fall calendar of activities and you'll see the weekday toddler daytime activities still listed as "Mommy and Me." A mom tasked with blowing up inflatables wouldn't feel guilt if two girls walked up to her. The other moms wouldn't blink twice at the idea. They'd shoot each other supportive smiles. But a dad at a pool, seemingly by himself, suddenly surrounded by young girls? Well, thanks, terrified media and paranoid parents for making me feel like a predator when I'm just at the pool on a Friday afternoon with my boys. Buzz Bishop is a Calgary dad, broadcaster, and writer. You can find his parenting blog at DadCAMP, you can follow him on Twitter, and on Facebook.